Medical science continues to progress, allowing doctors to push the boundaries and always achieve more. One such example is the implantation of heart valves via the groin (percutaneous valve replacement /TAVI) – a procedure which has reached full swing in recent years due to it shorter recovery period and less invasive nature. Some questions, however, are still asked. Are costly procedures such as this as successful as scientific studies are? Do these innovative techniques have the effect of reducing mortality? Are the results as good in one hospital as in the other? 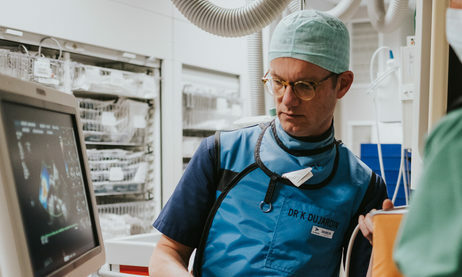 “Such information is crucial for all members of our multidisciplinary team of doctors, carers and paramedics – they allow us to further improve the quality of our care,” says Dr Karl Dujardin, a cardiologist at Delta General Hospital, Roeselare, in Belgium. Although these questions seem simple, it was almost impossible, until recently to answer them, he states. While both Dr Dujardin and his colleagues kept records of their procedures, for example, they lacked an overall vision of the effectiveness of the treatment. When Dr Dujardin and his team wanted to know the average age of their patients or the rate of successful interventions, for example, they had to manually enter information in Excel from files, by hand. “It took a lot of time and we could only compare one aspect at a time,” Dr Dujardin recalls. Dr Dujardin speaks in the past tense when describing his manual data entry procedure. Now, his team uses Lynxcare’s intelligent medical software, allowing users to consult the statistics of all past operations, including mortality rate, average age and the state of patients before and after their procedures. The Lynxcare medical start-up in Leuven has developed a data extraction method (Clinical Natural Language Processing & Machine Learning) for this purpose. The software operates in the Microsoft Azure cloud environment, where health data can be securely and confidentially processed and viewed by physicians. In addition, the application integrates seamlessly with the electronic patient record, which will soon be implemented across the Delta General Hospital. Lynxcare’s technology can automatically read and code old reports of operations, observations and consultations. All of this information is stored in a database that is updated in real time, and the system is based on the criteria of a major Dutch study on valve replacement operations, so that data from the Delta General Hospital can be compared to statistics from Dutch cardiology centres. The new system has given Dr Dujardin and his colleagues a much better overview of the risks of the different interventions. He now knows precisely how many cases have occurred, and whether they occurred shortly after the operation, or years later. He can also check how many of his very old patients are still alive after five or seven years, and what their state of health is, thanks to his intervention. Such learnings are incredibly important. Life expectancy is increasing, and as a result, the number of people suffering from a narrowing of the aortic valve is also on the rise. In addition, there are elderly people who are generally still suffering from other ailments, but who in many cases may, after such an operation, continue to live for a certain number of years in good conditions. At first, Dr Dujardin and his team had to overcome some hesitation in the mobilization of artificial intelligence, he admits. Is this technology as accurate as a doctor who captures data? For this reason, they performed a manual check on a number of patients whose records had been read by Lynxcare. “Everything matched perfectly,” concludes the cardiologist.